Salcura Antiac ACTIV Liquid 50ml Spray is a natural formula which is used to treat acne prone skin. The ACTIV range is used to overcome a flare-up or persistent moderate or severe acne. The product is completely free from any chemicals or artificial ingredients, including alcohol, lanolin, antibiotics, sulphates, parabens and benzoyl peroxide. The star ingredient in the product is sea buckthorn, combined with Eucalyptus, manuka and sandalwood. The Salcura ACTIV range is available as a 50ml or 100ml spray and a 15ml Gel Serum. Salcura Antiac ACTIV Liquid 50ml Spray should be kept out of reach and sight of children. It should not be stored above 25 degrees Celcius. Salcura Antiac ACTIV Liquid 50ml Spray is used twice a day - in the morning and evening. 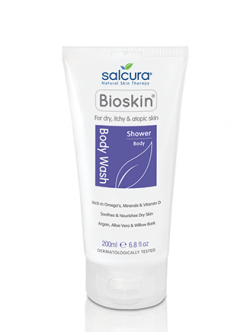 Before use, you should make sure to wash the area of skin to be treated. Gently pat the skin dry. Avoid rubbing the skin as this may aggravate the skin. 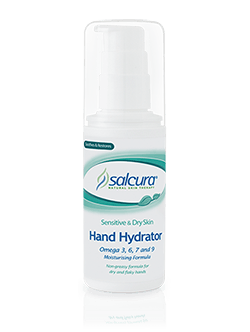 Once done, apply the spray onto your hands or a cotton pad and massafe onto the affected areas so that it almost disappears into the skin. Continue using the spray in this way for as long as necessary. Depending on the severiy of the acne, it may take several weeks before you see a real improvement in your skin. The active ingredients in Salcura Antiac ACTIV Liquid 50ml Spray are sea buckthorn, Eucalyptus, manuka and sandalwood. Other ingredients include aqua, glycerin, glyceryl cocoate, hydrogenated coconut oil, helianthus annuus seed oil, lecithin, sodium cetearyl sulfate, cetearyl glucoside, polyglyceryl-3 caprylate, polyglyceryl-4 caprylate, alcohol denat, zinc PCA, arginine, bisabolol, glyceryl laurate, p-anisic acid, melaleuca alternifolla leaf oil, citrus aurantium dulcis peel oil, eucalyptus globulus leaf oil, lavandula angustifolia oil, rosmarinus officinalis leaf oil, leptospermum scoparium branch/leaf oil mentha piperita oil, citrus aurantium amara flower oil, carthamus tinctorius seed oil, hippophae rhamnoides kernel extract, rosmarinus officinallis leaf extract, prunus amygdalus dulcis oil, olea europsea fruit oil, aloe barbadensis leaf juice powder, vitis vinifera seed oil, maris sal, isononyl isononanoate, ceteareth-25, cetearyl alcohol, beta-carotene, phenoxyethanol, ethylhexylglycerin, caprylyl glycol, limonene and linalool. 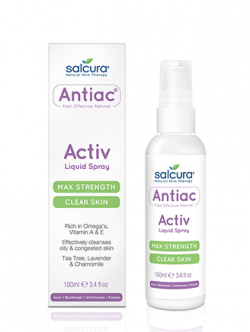 Salcura Antiac ACTIV Liquid 50ml Spray should not be used if you are allergic to any of the ingredients in this medicine. You should take care when applying the gel - only apply it on your skin. When using it on your face, keep it away from your eyes and avoid getting it inside your nostrils, on your lips or in your mouth. Depending on how sensitive your skin tends to be, it is a good idea to initially test the gel on a small area of skin, then waiting for 24 hours before applying to larger areas. This is especially advisable if you have unusually sensitive skin or if you are treating your face.